The numbers are staggering. There are approximately 14.5 million cancer survivors in the country today. For every one cancer death, there are three new cancer diagnoses. Each year as more people survive cancer, those survivors navigate quality-of-life issues like sexual side effects—specifically sexual dysfunction—caused by their cancer treatment. According to the National Cancer Institute (NCI), many types of cancer and cancer therapies are associated with sexual dysfunction. Research indicates that 40-100 percent of cancer patients suffer from some form of sexual dysfunction after treatment. Unlike many other cancer side effects, sexual problems commonly do not go away during the first two years after treatment. In fact, many problems remain constant and relatively severe. As a medical professional, screening your patients for sexual issues is critically important. You can get them the help they need, and you can significantly improve their quality of life. Though we are inundated with sexual images, content, and language in our culture today, many doctors don’t have meaningful conversations about sexual beliefs, behaviors, or relationships. As a result, you may not be consistently discussing potential side effects with your patients, but instead, waiting for them to ask you for help. This hesitation causes many patients to suffer in silence. You can learn to be more proactive. Establish consistent practice behaviors and use screening tools to help identify areas of concern. Require your patients to complete a baseline sexual health questionnaire before cancer treatment ever begins. The answers will give you a snapshot and baseline of their basic sexual health information, and will help you better understand your patient’s sexual health prior to cancer treatment. At least once during active treatment, it’s important to administer another screening tool to capture any changes in your patient’s sexual functioning. Many patients aren’t focused on sexual activity during treatment, so there may not be much information to assess at that point. The questionnaire serves not only as a screening tool, but also as a way to normalize the topic, and help patients bring concerns forward. Any information provided on the patient questionnaire should be discussed one-to-one with the patient in a safe supportive environment. Distress screening tools such as the Problem List and the Thermometer may be appropriate to recognize distress for many practical and physical issues. However, they may not be sufficient to uncover the complex issues of sexual health. Specific screening tools for sexual health can help identify any concerns for your patients to determine whether the problem is related to their cancer or treatment. You can help set patient expectations of possible sexual dysfunction through both written and verbal communication. The National Comprehensive Cancer Network (NCCN) published clinical practice guidelines in oncology in 2014 that approach treatment regarding survivorship. 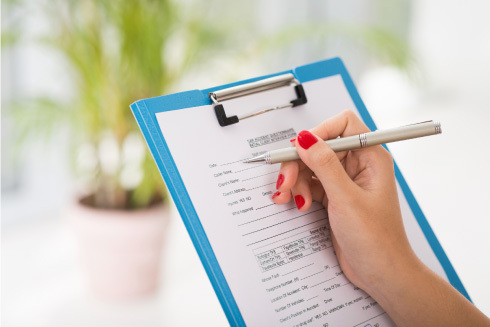 The goal of these guidelines is to identify any sexual health concerns for your patients, to determine whether the problem is related to their cancer or treatment, and to take necessary steps to manage or resolve the problem. In addition, I’ve developed a Sexual Health Script for Medical Professionals that can assist you as you develop your own custom assessment for patients in your clinic.